Prepare yourselves for Oct. 21! Korn are currently touring across North America with Rob Zombie and will co-headline even more U.S. dates with Breaking Benjamin later this year. The new stuff is going to sound like the old stuff according to guitarist Brian “Head” Welch. In a recent radio interview, he said the new stuff is basically the heaviest we’ve heard the group in a long time! “We started writing a few weeks ago, and we have a bunch of ideas, so it’s really coming out quickly. It’s pretty danged heavy. I mean, we’re really pleased with what’s going on. But, you know, we’re five guys in the band, so we just… we just want everyone to be happy with the album. We want everybody to be smiling at the end of the process. So we do have other things to consider. But, yeah, we’re gonna come out heavier than anyone’s heard Korn in a long time, I think. And just the beginning stages [of the writing process] are proof of that to me. So I’m excited! When asked if it has anything to do with performing the band’s self-titled debut album in its entirety, he said it did! So hey, who knows. 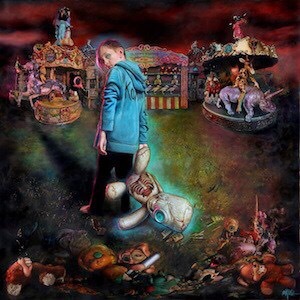 Maybe this time next year we’ll all be raving about how Korn’s new record is a return to form and it’s really good! Wouldn’t that be at least a little bit cool? Korn have lined up a final leg of their 20th anniversary tour celebrating their debut release by playing it in full. They will be joined by Suicide Silence and Islander. Korn just announced the final leg of their 20th anniversary celebration… a huge fall tour with Suicide Silence and Islander. The band will be playing their entire debut album in full playing intimate venues reminiscent of their debut.